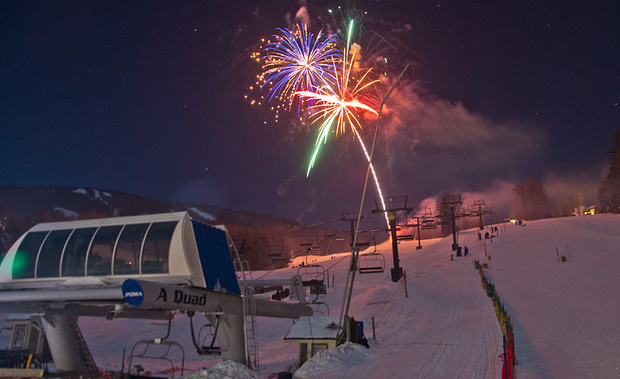 Let It Glow at Okemo! Stratton Mountain Resort had a powder day on December 25, 2017 thanks to Winter Storm Ethan. Mother Nature brought Bromley Mountain the gift of snow this holiday season, December 25, 2017. As Vermont’s resorts welcomed in the new year, a snowy December and ealy January had paved the way for great conditions over Martin Luther King Jr. holiday weekend. Close to two feet of snow fell between Christmas and January 8th and allowed for Vermont’s ski and snowboard resorts to operate close to 100% of their terrain. “The skiing and riding here is outstanding, maybe the best conditions in the country right now,” said Jeff Wise, Marketing and Communications Director at Stowe Mountain Resort. Further north at Jay Peak Resort snow totals are nearing 150” for this season and down south, Killington Resort and Mount Snow Resort are estimating 62” and 45” respectively. Paired with gifts from Mother Nature, Vermont’s world-class snowmaking and grooming capabilities assure that snow conditions will remain exceptionall into the holiday weekend. “These consistently chilly temperatures are keeping the snow surface in great shape and the natural snow we had, combined with favorable snowmaking conditions, have allowed us to open 99 percent of our terrain – plus we been able to make snow for an earlier-than-normal opening of our superpipe this season,” said Bonnie MacPherson, Director of Public Relations at Okemo Mountain Resort. Visitors coming to the Green Mountain State for Martin Luther King Jr. weekend can expect a plethora of events and activities such as torchlight parades, festive concerts, demo days and more. Families will enjoy “new on-hill additions such as free Family Fun Races on weekends and our new flow trail on Lower F.I.S., built with the excitement of mountain biking in mind, the mountain is in prime shape for the MLK Holiday weekend,” said Mike Chait, Public Relations Director at Smugglers’ Notch Resort. With just a few weeks until the popular holiday weekend, resorts are booking up quickly. Lodging and lift ticket deals can be found online at skivermont.com, as well as up-to-date snow conditions. Martin Luther King Jr. weekend at Mount Snow is once again chock full of events and activities for the whole family. These include a Torchlight Parade and Fireworks on the 14th, The BMX Winter xDrive Experience running all weekend long, offering guests the ability to rip around a custom build snowcross course in a brand new BMX SAV, and then Grommet Jam over at Carinthia Parks on the 15th. They’ve also got Pink Talking Fish playing a night of David Bowie and Roots of Creation at The Snow Barn, Southern Vermont's favorite live music venue. With simply too much to list here, so please visit mountsnow.com/events. Stratton skiers and riders enjoyed a head start on winter with double the open terrain as the season got started, and that excitement continues as the January Martin Luther King Jr. holiday arrives with a full slate of snowy fun including dogsledding, snowmobiling, cross-country skiing and the first Stargazer Snowshoe hike on January 13 with an off-grid experience set along the Stratton Nordic Center trails. For live music, it’s the Josh Panda Party at Grizzly’s for après and DJ Dread for late night. On January 14, First Run in the Village hosts a free demo with Head and Elan skis; reps will be on hand to help point skiers toward the right model for them. Mid-January means winter is in full swing, and a 3-day weekend at Bromley is a great choice. For savings up to 50% on Martin Luther King Jr. weekend lift tickets, buy early and online. Festivities don’t end on the slopes – after a full Sun Mountain day of shredding, stop in to the Wild Boar Tavern for an après beverage and live entertainment – featuring music by Jack Waldheim on Saturday and Gilbert the Band on Sunday. Martin Luther King Jr. weekend at Okemo means three days of family fun. In addition to some of the best skiing and snowboarding in the East, visitors can enjoy mountain coaster rides, ice skating, snow tubing, snowshoeing, cross-country skiing, swimming, indoor golf, racquetball, fitness classes, aerobic and weight training, massage, sauna, relaxing by a fire, or simply soaking in a hot tub. And if that weren’t enough, On January 13, Okemo will host a mind-bending landscape of light set to music with its Let It Glow laser light show spectacular. On January 14, Okemo offers a fun evening of ice skating with a live DJ, games, and fun for the whole family in Okemo’s Ice House skating pavilion at Jackson Gore. Spend MLK weekend at Killington Resort and experience some of the most unique opportunities for young skiers and riders. Save on lodging and lift tickets by taking advantage of the Ski & Stay Package. On January 13, the Mini Shred Madness allows grom skiers and snowboarders, 13 years and under, the chance to get a feel for park riding and its rules in an open jam contest. Centered around having fun and the NSAA’s Know the Code efforts during National Safety Month, this contest is a great way to introduce young competitors to the park. Martin Luther King Jr. weekend at Sugarbush Resort is chock full of events for the whole family. Enjoy numerous culinary events including S’more Cookouts, Kids Pizza & Movie Night, and Kids’ Cooking Class. Don’t miss the Torchlight Parade and Fireworks, Local Artisan Markets, and Photography Outback Tours. Kick off Martin Luther King Jr. weekend one day early at Bolton Valley on Friday, January 12 with a $29 lift ticket. These tickets must be purchased in advance by Wednesday, January 10 and $15 from every ticket will be donated to Girls on the Run Vermont. The Village Café Music Series will feature live music with Cole Davidson on Friday night and Zack Dupont takes the stage on Saturday evening. Saturday, January 13, artist and Bolton Valley local, Natasha Bogar, will be guiding artists of all abilities through the creative process of painting. Everyone ends the evening with a painting that they created. The cost is $40 and advanced reservations can be made online. To finish off the holiday weekend, Andy Parry and the Tell A Friend Tour will light up the park on Sunday, January 14. This event is free to all park skiers and riders and includes a free pizza lunch. Wrap up your Sunday with a visit to the Bolton Valley Winter Farmers Market held at the Sports Center from 1-5pm. 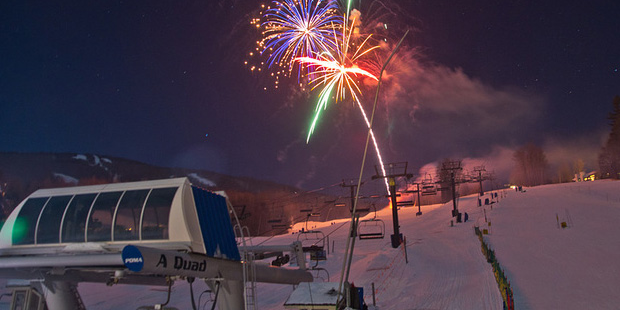 With over 100” inches of natural snowfall and world-class snowmaking, Stowe Mountain Resort was 100% open for the year-end holiday week and January’s MLK holiday will be no different. All three peaks will be open and offering a huge variety of terrain for every ability level. Guests can also save 30% on lift tickets by purchasing online at least 48 hours in advance. As Smugglers’ Notch prepares for a successful Martin Luther King Jr. weekend, room bookings are inching closer towards capacity. Families will have a blast this holiday weekend as the kids will love the debut of their brand-new Kids’ Club, with freebies, special activities, and so much more. For a full list of events at Vermont’s resorts visit the Ski Vermont Events Calendar.